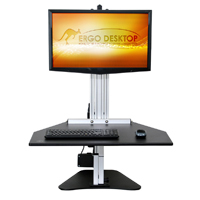 The Performer Electric Table Base from Foxbay allows your entire workstation to raise and lower easily and quickly at the touch of a button, offering a practical and efficient solution for sit/stand or multiple-user workstations. 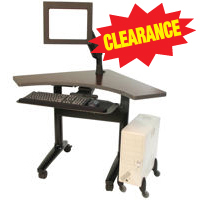 A variety of configurations are available, including straight, L-shaped, and U-shaped workstations. Only the base is included; the top from an existing desk may be used, or a work surface may be purchased separately, sized from 44" to 62" wide. The work surface can extend up to 18" longer than the base. 25.5" of adjustment, from 24.5" to 50.0"
The ELITE Electric Height Adjustable Desk Base from iMovR is an advanced, versatile and elegant electric height-adjustable frame with multiple width-adjustment settings for tabletops ranging from 48" to 83" wide. Synchronized ultra quiet (under 46 dB) BOSCH motors are housed in each leg, providing a travel speed of 1.5" per second with a lift capacity of 265 lbs. Height adjustment ranges from 24" to an impressive 50". The digital control offers 4 programmable memory presets and displays the actual height in inches. In addition, the energy consumption of the electrical parts is low: less than half a watt in standby mode and only 1.4A under continuous lift. 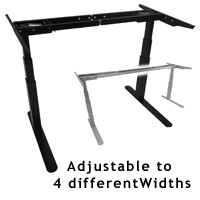 The ELITE desk base comes in both black and silver models. Thermodesk ELITE and Omega Everest Thermodesk Tabletops equipped for quick measure-free installation on the Elite frames are available in numerous widths and colours.